The 1790 is portable enough to be pulled by a light duty pick-up truck, yet powerful enough to fill even the largest chip trucks. It incorporates several Carlton exclusive features like dual lift cylinders, Imron paint, 32-cubic-inch infeed motors and integrated reversing autofeed. The 88 hp turbo diesel Kubota engine powers massive 10 ½ x 17-inch feed rollers allowing the 1790 to easily chip 9-inch material continuously. 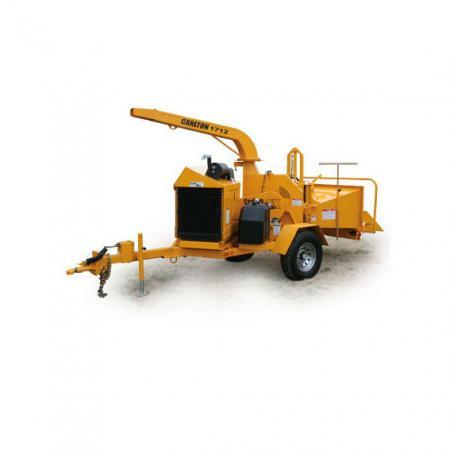 The Carlton 1790 wood chipper is built to withstand the punishment you dish out. From the heavy duty infeeders to the formed infeed, the Carlton 1790 is the most solidly constructed chipper on the market today. Thoughtful design elements like concealed wiring and full-length radiator protection guards keep the 1790 operating at peak performance from year to year. For DURABILITY and DEPENDABILITY nothing compares to Carlton.